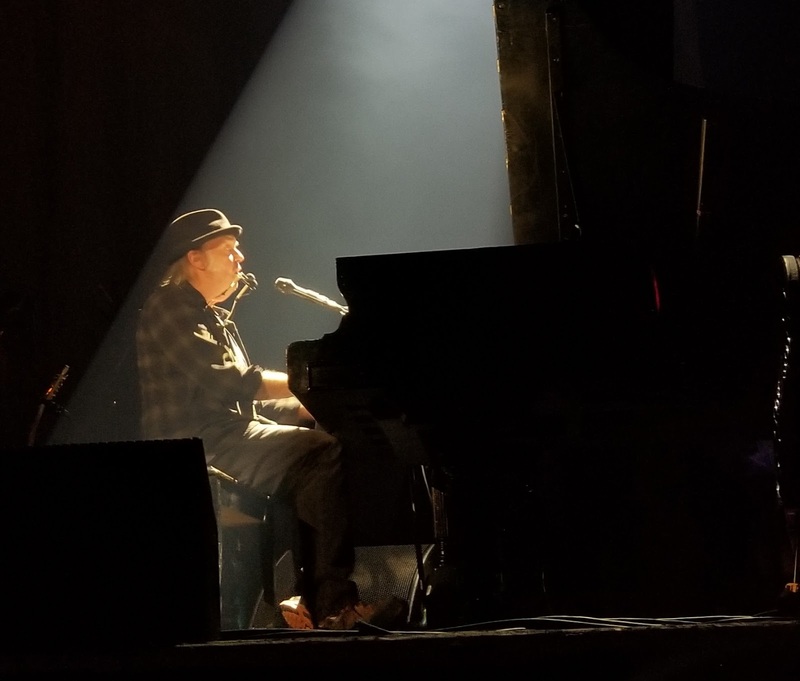 Neil Young's The Big 3M Theater Tour of the Midwest begins tonight at the Riverside Theater, Milwaukee, Wisconsin, January 23. The solo concert tour continues on to Madison 1/24, and Minneapolis 1/26, 28-29 & 31. Neil Young Solo: "Broken Arrow"
Don't forget the 4th M: Manitoba!! Will there be a live stream for any of these shows? @ Hawk - not tonight. check for last night of run. "The songs are coming back. Here they are! Wow. They are are not the ones that usually show up. They are better known. Because they are easy to sing they are perfect. This is the moment to explore their grooves, their canyons, their computer history." a setlist less heavy on rarities? Back in the Olden Days?NEW? Why is this called the "Big 3M Tour?" is 3M sponsoring it? Don't Be Denied aborted after 1st verse. Yeah and the second night? 2 minor changes. Number of songs dropped. Then later shows get back to back nights packed with rarities. I didnt pay to see both shows for 2 unique songs the second show. Thanks for the setlist, and I hope everyone enjoyed themselves last night! Thanks for the early setlist anon. you beat everybody. oh when will the Bozos shut the hell up. No more alcohol sold. @ adam - why not run up to Madison tonight and give us a report? If disappointed, we'll run fundraiser for you here on TW. I almost got tix to this Thrash. That's why it hurts. And I'm not a jerk who hates Neil. I love Neil and like you know that Thrasher is his greatest song and the most pure expression of NY. I didnt have the money. I didn't have the money for Chicago. You are a lucky person indeed Adam2. You managed to see him twice! Last nights show, for me anyway...... was amazing! @ jam jet- would love to hear more from you on last night, please. Neil says Great Crowd last night. What show did that reviewer attend. Fake review I guess.Check the Times Contrarion section that Neil wrote. The reviewer found the crowd rude. Im sure theres many times where they were. It doesnt make the review fake. But yea, whats most important is the performer didnt. If youre frustrated at the song selection well you pay your money and take your chances. Like is a constant crap shoot of unknowns. One More Sign. Never had been played anywhere. Rare enough for you? The show was shaping up to be an all time GREAT one! Neil was clearly channeling loss, grief and melancholy with both his song selections, pacing and interpretations of his classics and he was in the zone like I’ve rarely seen him. As it progressed the crowd got rowdier and It was annoying but those in the crowd shouting were out of love, not anger or bitterness. You could tell Neil was getting pissed and he dropped a few hints. Finally, just like the second night acoustic show in Chicago years ago, got fed up, played a few more and left. Unfortunately, It happened obviously during don’t be denied. Having said all that, last night was the best solo NEIL I’ve seen in over 50 shows going back to 1974.Even better than that epic acoustic show at Red Rocks many years ago. If some in the crowd had been just a bit more subdued in their exuberance and love, it easily coulda been a 2-3 hour show! My guess is if Madison can be a bit more restrained, tonight could be EPIC! If we allow him, this could be the BEST EVER! Adam, it's all one song. 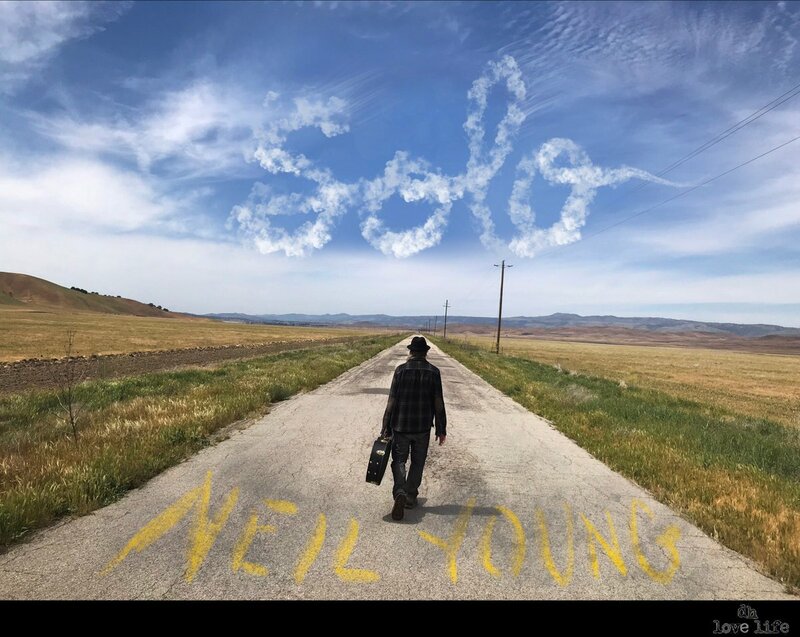 Neil does not play two- to three-hour solo shows these days. 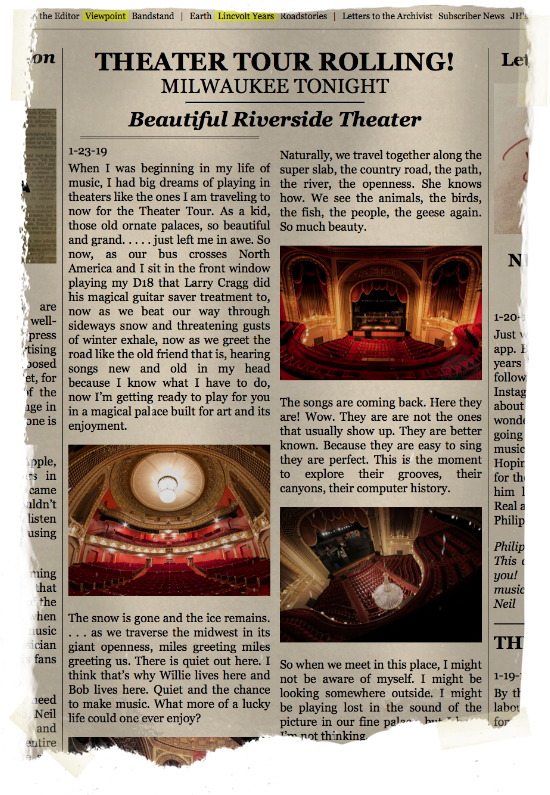 Here's what he had to say about last night in the Times-Contrarian: "We had a great time in Milwaukee. Played some songs for the folks! It's always great to get the first one behind you. What a crowd! - a real NYA experience." And he did play five more songs after Don't Be Denied, which others have said was abandoned because of tuning issues. I felt there was some rude behavior at the Milwaukee show...but Neil did not seem phased at all. I have a pretty low threshold for the stupid yelling in the middle of an acoustic song and I would prefer to hear Neil's guitar work to the end of a song rather than a chorus of Ric Flair-esque "woo"s. I also can do without people singing along with Neil (which seemed more prevalent last night than any other show I've attended). The most annoying behavior was cell phone related. Lots of folks ignoring ushers requests to stop and annoying flashes of light. Crotchety complaining aside, it was a fantastic show. Better version of Thrasher than I had previously seen in Chicago a few years back. Interesting new song that referenced the recent fires. Somber tone throughout. Seemed to make it a point to bring Harvest Moon to a more dramatic conclusion. The incomplete Don't Be Denied was a nice tease (which included a dramatic hand raised stop sign when he ended it). Could never hear Heart if Gold again and be okay with that. But cool to hear Mansion on the Hill on acoustic and Like a Hurricane (though I love the pump organ version). Cortez is always welcome...along with Cowgirl and My My Hey Hey. Cherish each show folks. I thought the show was great. Mansion was so unexpected- I was over the moon instantly. Somone requested everybody knows and he played it. +1 for the song shouters haha.. I don’t really mind when people sing along to certain songs.. I get why people don’t like that, but when we all sang my my hey hey I had chills. I thought the crowd was positive and enthusiastic- not like Chicago last year, which was more rude and aggressive “PLAY OLD MAN, OLD MAN”- this show wasn’t like that. Let the people celebrate his music.. The crowd was pretty cool. Maybe it was just my section, maybe it’s just me. At any rate that was the best solo show I’ve seen. So, 20 songs tonight in Madison (with a reportedly well-behaved crowd), 19 last night. So much for the cut-it-short theory.